The lemon is rounded and slightly elongated, it belongs to the family of citrus fruit and therefore it shares many of the characteristics of other species of citruses, as for instance the thick skin. The pulp is pale yellow, juicy and with an acid flavour; it is divided in gores. The skin is yellow and specially bright when it is ripen. It is used fresh for cooking, and its juice is used in the industry for processed foodstuffs. For the pharmaceutical industry it is the raw material for many medicine manufactures, and at home it is used for different homemade remedies. The lemon has multiple properties: it reinforces the immunological system, it revitalizes, it activates the calcium metabolism for bones and teeth, it cures haemorrhages, it rejuvenates and it helps in sliming diets. Nevertheless, as a very energetic fruit, it must not be given to elderly people and those in acute nervous condition. Its characteristics are very similar to the other bitter fruits, because both their skin and pulp are similar, although the colour and flavour may be totally opposed, specially if we compare it with the most representative fruit of the family, the orange. The lemon is a round, slightly elongated fruit, it has a strong and resistant skin, with an intense bright yellow colour when it is totaly ripe, giving off a special aroma when it is cut. The pulp is pale yellow, juicy and acid, divided in gores. It is only consumed in fresh in the gastronomy field, its juice is used as seasoning for soups, drinks, salads, fish dishes and hundreds of confectionery products. In cooking, the lemon shares its importance with the Mexican limes. The lime comes from Malaysia and its culture is more restricted to the humid and warm tropical and subtropical areas, since it is very sensible to cold weather. The lime is a smaller fruit, it is consumed green and it is used in countries like France. Limes are divided in two groups: acid limes, with a marketing interest, and sweet limes. The acid limes are on their turn subdivided in two groups: limes " Tahití ", " Persa’ or " Bearss" from the group Citrus latifolia, which are larger; and limes ’Key" or "Mejicana’ from the group Citrus aurantifolia, which are smaller. The limes of sweet pulp are Citrus limettioides and the most cultivated variety is the so-called Dulce de la India. Since they are not acid, they do not replace lemons. At an industrial level, the lemon is used for the extraction of the pulp’s juice and essential oils. The skin is also used as cattle food, and for the extraction of pectins for the industry. Lemons are also intended for the pharmaceutical industry, due to their high vitamins content: A, B, P, K and mainly C, for the manufacture of several medicines. It has a healing purpose not only through medicines, but also at a homemade level we can use it as astringent, digestive tonic and other useful purposes. For the hardware industry, it is also a very valuable raw material in the manufacture of stain removers, detergents, perfumes made of oil extracted from the skin, etc. The production period goes from April to July in the N Hemisphere, although thanks to the wide range of different varieties with different maturation time we have lemons uninterruptedly throughout the year. The tree is small, about 6 meters high, perennial, with indented and pointed leaves. It does not demand soil quality, that is why it stands both sand and clay soils. It is very sensitive to chilling, frosts and high temperatures, more than the orange, mandarin or grapefruit trees. The flowers, big and purple, are grouped in inflorescences. There is a characteristic that distinguishes the lemon tree from the rest of citruses: it bears more than one flowering per year, that is to say, the lemon trees are re-flowering. In the same tree we can find lemons in different stages of growth. This phenomenon has allowed us to obtain, by controlling the production, some lemons in the time of the year when they are scarce. 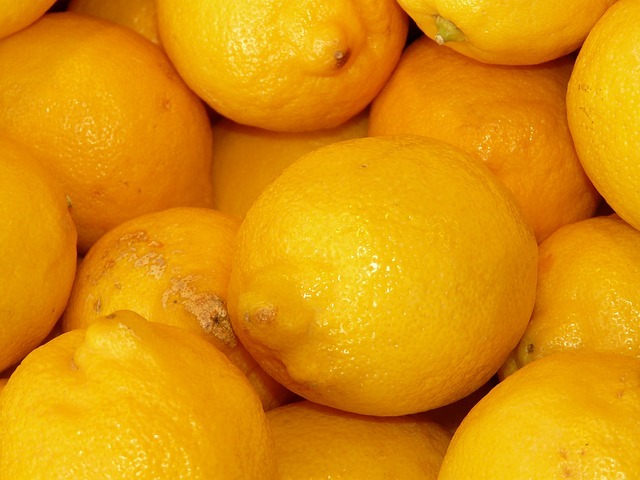 Besides, by controlling the flowering, lemons can be stored for long periods of time without quality loss. The lemon belongs to the family of the Rutaceae, the genus Citrus, species Citrus limonum. It is an oval fruit, around 7-12 cm long, golden yellow rind, pointed with glands containing essential oils. The pulp is divided in gores that contain a juice of extremely acid taste. Inside them and depending on the varieties, there are small, slightly round and pointed seeds. The lemon is divided in three zones, the most external one is the exocarp or flavedo. Formed by an epidermis with small vesicles that contain essential oils, used in colognes and aromatic scents. The following layer is the mesocarp or albedo, spongy and white. To finish with, we find the endocarp or pulp, where juice bags and seeds are stored. The juice bags or vesicles are lengthy structures that grow in the endocarp and extend towards the interior of the fruit, until they fill it up completely. These vesicles contain organic acids and sugars, that along with water constitute the juice.